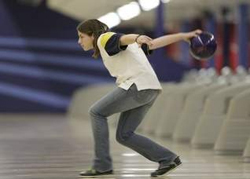 Nicole Baginsky, ACS '06, is making quite a name for herself in high school bowling. Nicole captured the crown in the Greater Middlesex County (GMC) Individual Girl's Bowling Tournament. In doing so, she became the first student from her high school to ever win an individual title. Nicole is a junior at Bishop McCarrick High School and sings in the parish choir. ACS is proud of our graduates. If you know of an achievement attained by an ACS graduate, send information to the school office.